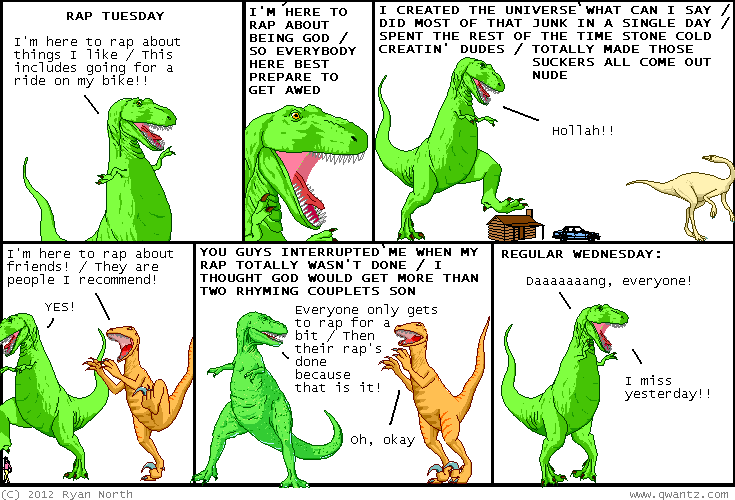 Dinosaur Comics - October 9th, 2012 - awesome fun times! October 9th, 2012: I have been teasing the SECRET PROJECT being announced this week at New York Comic Con, the one that Anthony "Nedroid" Clark and Chris "Dr. McNinja" Hastings and Me "You Are Already Reading My Comic So There's No Need To Click This Link" Me are doing with Shiftylook. But for those of us who won't be at NYCC (including me, though there will be a cardboard cutout of myself there in my stead, because that's what happens in reality!) there is a livestream we can watch! RIGHT HERE. And there's a schedule too! LET'S ALL WATCH IT, ESPECIALLY THURSDAY FROM 5-6 PM.